Written in England at the end of the 13th century, this bible manuscript was owned in the 15th century by the community of English nuns of St Brigitta (or Brigittines) whose house, Syon, was originally located near Twickenham. Single volume bibles were rare in the early middle ages, but the great monasteries began to have large opulently decorated bibles made for their chapter houses by the 12th century, to show off to visitors. This bible is less impressively produced, probably having been made for theological study. It contains a 'duplex psalter' or the Book of Psalms in two Latin translations, called the Hebrew and the Gallican. A view of a page of text shows the no-nonsense presentation of a bible made for study. 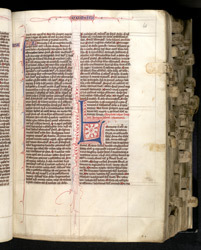 Decoration is limited to pen flourishes, but the layout of the text is clear, with the red inscription in the right column indicating that the Book of Leviticus ends and Numbers begins. Along the edge of the pages, tabs protrude to help the reader locate the beginnings of other books.